Medical Assistance Sierra Leone is working with Africa Surgery Inc. and the Foundation of Orthopedic & Complex Spine Surgery (FOCOS) to provide urgent treatment to people in Sierra Leone suffering from severe scoliosis or Potts Disease, a debilitating TB of the spine. There are no facilities for such treatment in Sierra Leone; operations are performed in Ghana free of charge by the FOCOS surgeons but travel and hospital costs for the long stay in Ghana need to be met. This amounts to $10,000 (approx £6,500) per person. There are generally two surgical visits to Ghana annually. There are usually twelve people in a group, almost all of them children, and two chaperones. The stay in Ghana can be from two months to six months depending on the recovery period required. A small number of the children (those who live in very rural areas, and who are responsible for manual tasks) may remain with the project’s ‘community mother’ for a year after surgery to ensure that the metal rod inserted in their spine stays in place and that the recovery is managed with rest and adequate nutrition. Thirteen year old Mamasu Bangura underwent surgery supported by MASL in 2012. Mamasu’s collapsed spine was causing extreme pain and the FOCOS surgeons worked for 14 hours on reconstructing her spine. Mamasu returned to Freetown over five inches taller. When MASL trustees met her again just four months later she reported that she has no aches, pains or stiffness. Mamasu’s surgery was very complex and the surgeons said that she would not have survived without urgent intervention. The pictures below show Mamasu’s spine before surgery, back in Freetown with a back brace and now fully recovered. The mother of six year old Mariatu Kamara brought her daughter from their small village in a remote area of Sierra Leone to Freetown. 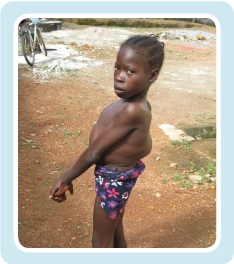 Mariatu had TB which had damaged some vertebrae of her lower neck. 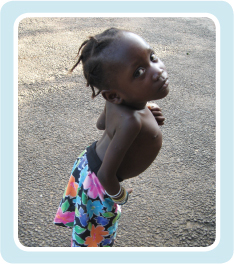 The pain from this infection caused Mariatu to keep her head always up and her spine always arched. Mariatu completed six months of anti-TB medication and was sent to Ghana for urgent treatment in July 2013. Early intervention prevented paralysis and undoubtedly saved her life. Rugiatu Kargbo is eight years old and living in a rural village in Sierra Leone. When she was six years old, Rugiatu’s spine fractured as a result of a tuberculosis infection which had weakened some of her vertebrae and left her with an open and weeping sore on one side of her back. Rugiatu’s TB was cured with a series of medications, but she needed urgent surgery: X-rays showed a spine which was likely to collapse further and leave her legs paralyzed and could cause her to be incontinent. In July 2013 Rugiatu went for surgery in Ghana and is now fully mobile and pain-free.